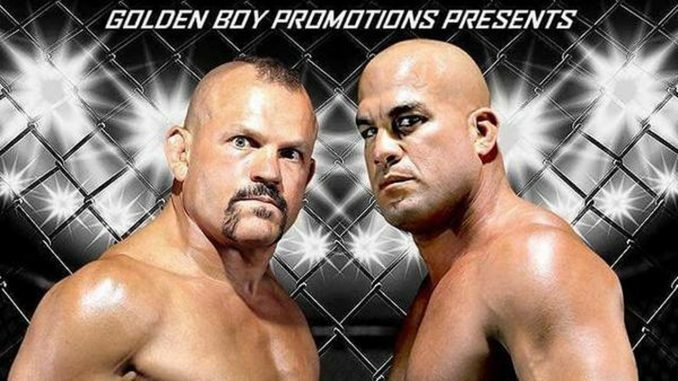 John Pollock's coverage of Golden Boy MMA's card from The Forum in Inglewood, California featuring Chuck Liddell and Tito Ortiz coming out of retirement for their third fight. Welcome to our coverage of Golden Boy’s first MMA card from the Forum in Inglewood, California. The broadcasters are Todd Grisham, Frank Mir, and Rashad Evans. It began with one of the preliminary fights still going on inside the cage while the announcers previewed the main event. One of Silva’s cornermen slapped him to get him set to walk into the cage and was admonished by a commission member. There was minimal activity in the first round with Cota tying him up with his clinch against the fence. Cota landed with a kick to the body and was the busier of the two. Silva dropped him at the start of the second round, he tried to attack with shots and Cota got to his feet. Silva landed a big knee and then followed with numerous knees to the body while in the clinch. Cota landed two low blows and Beltran halted the action. Beltran said he was taking a point from Cota for the second low blow and another point for grabbing Silva’s glove, so this was a 10-7 round for Silva. Cota got a takedown in the third round, but it was Silva that got on top and applied a head and arm choke for the submission. Silva didn’t even have to advance from half-guard for the submission. With the win, Silva improved to 12-12-1. Morales is coming off three straight losses in the UFC to Brett Johns, Benito Lopez, and Manny Bermudez. Barnes is 36 years old and has fought for Bellator and Gladiator Challenge. Barnes took hold of Morales and was able to take him down in the first round. Morales attempted a triangle but absorbed some hammer fists in the process. Barnes avoided the submission and landed big shots in the final seconds to take the first round. Morales had problems with his left leg between rounds. Barnes takes Morales down again in the second round, he attacked Morales and gave him a horrible mouse under the right eye. He controlled the entire round but not enough for a 10-8. Barnes landed a huge takedown and Morales seemed rattled by it. Barnes mounted his back and went to work with ground and pound. Late in the round, Barnes transitioned to an armbar and tapped Morales. Barnes dominated the fight and looked very impressive against someone with experience in the UFC. Barnes has won five of his last six fights going back to January 2017 and improves to 11-3. Palacios was over the weight limit and they agreed to a 140-pound catchweight and Palacio missed that limit too. Palacios rocked Watson with a looping right shot and Watson seemed wobbled. Palacios chased him down and landed a right and left combo that sent Watson down and landed a kick as well. Palacios has fought previously for Combate Americas and won on Dana White’s Tuesday Night Contender Series this past summer. He has now won eight in a row. This is Tibau’s first fight since leaving the UFC after 28 fights with the promotion dating to 2006. Tibau took Escudero to the ground and entered half-guard and remained in the position throughout the round. Near the end, Escudero landed an elbow from underneath and cut Tibau over the left eye. They began landing big strikes on each other to start the second round and Escudero took Tibau down. There wasn’t much that occurred the rest of the round. I have it 19-19 after two rounds with Escudero taking the second round. Escudero appeared to have the striking edge in the third round until Tibau landed a knee to the body and took Escudero down. This was a close round, I have it 29-28 for Tibau. This snapped a four-fight losing streak for Tibau and improves to 33-13. Lawlor came to the cage lip syncing “Born to Die” by Lana Del Rey. Winn is 4-0 and a big prospect training at AKA. This is Lawlor’s first fight since March 2016 after serving a two-year USADA suspension that expired last month. Winn connected with a right hand and with limited shots he was still able to cut Lawlor under both eyes. Winn took the first round 10-9. Lawlor started to find his rhythm in the second round. Winn landed with a jab and connected with a right hand It was a better round for Lawlor than the first but still a 10-9 round for Winn. The third round began with both throwing and Winn got a takedown. Winn moved to side control and eventually they made it back to their feet. Winn lost his mouthpiece and Lawlor went for a guillotine, but Winn popped out of it. Winn won the fight 30-27 on my card. Winn said the crowd witnessed a new star being born today. The main event was preceded by the U.S. national anthem. The two were tentative at the start and reserved with their striking games. Ortiz was challenging him to strike and then Ortiz pressed him toward the cage and dropped Liddell with a right hand that sent him down and out with Ortiz finishing him quickly. Liddell was slow, and it wasn’t going to end well. Ortiz thanked Liddell for taking the fight and allowing him the opportunity to start something with Golden Boy and pushed him hard. The two shook hands and hugged. Liddell said he made a mistake and got caught and has no excuses. He will have to sit back and figure out what is next, he did not commit to another fight. Rashad Evans said he doesn’t want to see Liddell fight again. Born on a Friday, John Pollock is a reporter, editor & podcaster at POST Wrestling. He runs and owns POST Wrestling alongside Wai Ting.